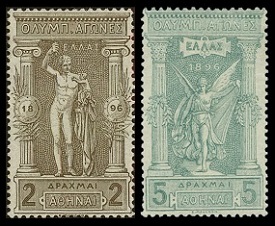 Commemorative Greek stamps first appeared in 1896. 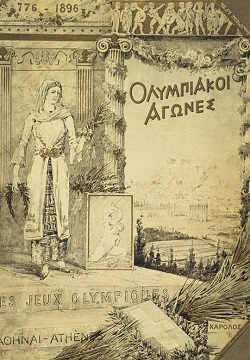 The BIG EVENT of 1896 was the rebirth of the ancient Olympic Games, officially called The Games of the I Olympiad (of the Modern Era), which took place in Athens, Greece from April 6 through April 15. The Ancient Olympic Games took place in Olympia, Greece from 776 B.C. through A.D. 394. The games were held every four years to honor the god Zeus, and athletes from all of the Greek city-states competed in them. An "Olympiad" was an ancient Greek term for a time period of "four years", thus the games became known as the Olympiad. The games continued well into the Roman Era. In A.D. 394, the Emperor Theodosius I (347-395) decreed that Christianity would be the state-religion of the Roman Empire, and he subsequently banned the Games of the Olympiad, as being a pagan festival. The Olympic Games of the Modern Era, a unique multi-national multi-sport event, was the idea of Pierre de Frédy, Baron de Coubertin (1863-1937), an aristocratic French educator and historian. He founded the International Olympic Committee in 1894. 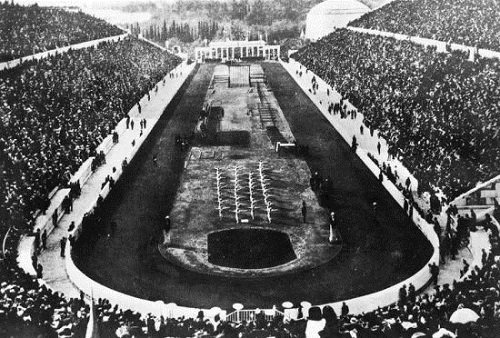 Athens was chosen as the location for the Games of the First Olympiad, as Greece was the site of the original Olympic games. Greece was experiencing some difficult economic and political problems, during this time, but due to the huge historical significance of this event, they chose to host the games anyway. Some 241 athletes from 14 different countries participated in the 1896 Olympics, and the Olympic Hymn was performed for the first time. Before 80,000 spectators, King George I (1845-1913) and Crown Prince Constantine (1868-1923) officially opened the games. There was no parade of nations or Olympic Flame at this stage, and all the athletes entered the arena together. The competing athletes were from the nations of Australia, Austria, Bulgaria, Chile, Denmark, France, Germany, Great Britain, Greece, Hungary, Italy, Sweden, Switzerland, and the United States. There were 43 events in nine sports contested during these games. Greece, the United States, and Germany led the medal count. Twelve commemorative Greek stamps were issued during 1896, to mark this historic event. These stamps will all be described in detail below. The 1 L. and 2 L. denomination commemorative Greek stamps (Scott #117,118) shown above feature a representation of ancient Greek boxers. The 5 L. and 10 L. denomination commemorative Greek stamps (Scott #119,120) shown above feature the Discobolus (discus thrower) by Myron, an Athenian sculptor of the 5th Century B.C. The original bronze sculpture is lost, but the Romans made copies of it in marble during the 2nd Century A.D., which survive to this day. 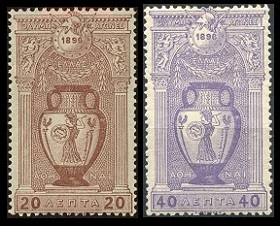 The 20 L. and 40 L. denomination commemorative Greek stamps (Scott #121,123) shown above feature an ancient Greek amphora showing Pallas Athene (Minerva). Pallas Athene or Athena was the ancient Greek goddess of wisdom, courage, civilization, law and justice, and the arts and crafts. She is the patroness of the city of Athens, which is named after her, and the Parthenon on the Acropolis to her. As an Olympian goddess, she ranks only below Zeus and Hera in importance. The 25 L. and 60 L. denomination commemorative Greek stamps (Scott #122,124) shown above feature chariot racing. Chariot racing was one of the most important events in the ancient Olympic games. A tethrippon or quadriga, a four horse chariot that was used in the ancient Olympic games, is shown on the two stamps. In ancient Greek mythology, the quadriga was the chariot of Apollo, delivering the daylight and dispersing the night. Note that the chariot depicted on the stamps is being driven by Nike, the ancient Greek winged goddess of victory. The 1 D. denomination commemorative Greek stamp (Scott #125) shown above features a depiction of Panathinaiko Stadium, with the Acropolis in the background. 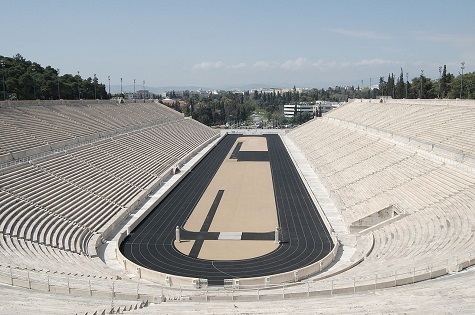 Panathinaiko Stadium is a multi-purpose sports stadium in Athens, which was used for the 1896 and 2004 Olympic Games. It is actually an ancient Greek stadium, originally built in 566 B.C. and then rebuilt in marble in 329 B.C. The stadium was renovated in 1869 and in 1895. This 2,580 year old structure is still in use, and it is the only existing sports stadium in the world that is built entirely of marble. The 2 D. denomination commemorative Greek stamp (Scott #126) shown above, at the left, features the 4th Century B.C. statue of Hermes holding the infant Dionysus by Praxiteles. The statue is now in the Archeological Museum at Olympia. Praxiteles was a renowned Attican sculptor of the 4th Century B.C. He was the first sculptor to create a life-sized statue of a female. Oddly, the word "praxiteles" in Greek means "he who finishes his works". The 5 D. denomination commemorative Greek stamp (Scott #127) shown above, at the right, features the 450 B.C. statue of Nike (Victory) by Paeonius. Paeonius of Mende was a Greek sculptor of the late 5th Century B.C. Though from northern Greece, his work reflects Athenian stylistic training. The statue shown on the stamp is from the Temple of Zeus in Olympia. The 10 D. denomination commemorative Greek stamp (Scott #128) shown above features the Acropolis and the Parthenon in Athens, Greece. The Acropolis of Athens is an ancient citadel, rising high above the city. The temples of the Acropolis were mostly constructed during the 5th Century B.C., under the direction of Pericles (495-429 B.C.). The Parthenon, built between 447 B.C. and 432 B.C. 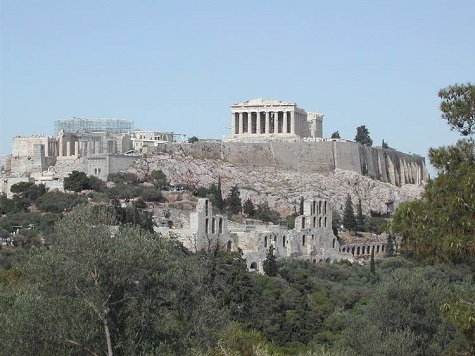 is the most prominent temple on the Acropolis of Athens. The Parthenon was dedicated to the patron goddess of Athens, Pallas Athene or Athena. 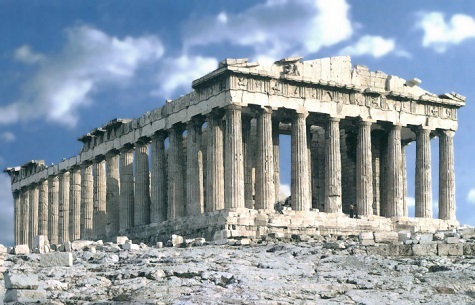 Though a sacred temple, the Parthenon was primarily used as a treasury by the Athenian Republic. During the 15th Century Ottoman conquest, the temple was used as a mosque, and later, in the 17th Century, it was used as an ammunition dump. In September 1687, the ammunition exploded, severely damaging the structure. The sculptures and pediments salvaged from the ruins are mainly in the British Museum, and all that is left today is the outside frame of the temple. Forgeries of the expensive high denomination stamps of this set do exist. Care should be exercised, when purchasing any of these stamps. Remember that some of the lots may be priced in currencies other than the U.S. Dollar. Shipping charges for foreign sellers may be more, and the lots may take longer to arrive. Also, make sure the foreign seller ships to your country, before bidding on or buying his lot. 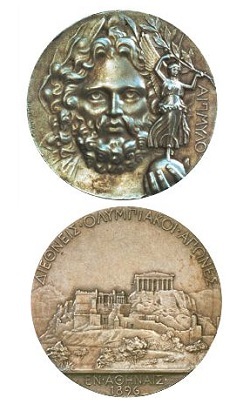 The obverse of the medal features Zeus, and the reverse features a view of the Acropolis and the Parthenon similar to that used for the 10 Drachma commemorative stamp. First place received a silver medal and an olive wreath. Second place received a copper medal and a laurel branch. During the 1900 Olympics, the winners were given trophies. It was not until the 1904 Olympics that the practice of giving gold, silver, and bronze medals began.